This is the first installment in my report from our NYC vacation. We had a long (3-1/2 weeks) vacation in New York City from mid-May to mid-June. We had a great time walking around the city, going to plays, art exhibits, bookstores, and spending time with family. It went by quickly and it’s taken over a week to get back into the swing of being at home. I thought that I would write my next few blog posts about the plays, museums, and restaurants that we went to. Pacific Overtures is one of my favorite musicals. I am a really big Stephen Sondheim fan and this musical is smart, entertaining, and hummable. The first time I saw this show was at the Ahmanson Theater in Los Angeles, in 1976 or 1977 (too far back to remember exactly). I absolutely loved it and bought the LP of the show. I played it so many times I’m sure my parents got sick of listening to it (I was living at home at the time before going away to graduate school). I have seen at least 4 productions over the years and have enjoyed them all. This latest version had an abridged book, 3 fewer songs, smaller cast, and a much smaller theater. All of that took away some of the Japanese atmosphere and pageantry that really set the environment in the original and other previous productions. I still love the songs and the story but I have to say that this production was not my favorite among those I have seen. This play grabs you and doesn’t let you go even though you know from the start where it will all end – even more so because we know what happened afterward through to where it is now. The play’s website describes the plot the best. 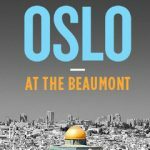 “OSLO is inspired by the amazing true story of the back-channel talks, unlikely friendships and quiet heroics that led to the 1993 Oslo Peace Accords between the Israelis and Palestinians.” The writing and acting is so tight and the tension is so high that you are on the edge of your seat during the whole play. The theatre is set up almost in the round with all of the actors are so close you feel like you are in the room with them. Oslo won the 2017 Tony Award for best play and it deserved it. We saw all four of the nominees and personally I agree with the Tony voters. Most of the details of the play and the Oslo talks were not public until the writer of this play, J. T. Rogers, sat down with the 2 Norwegians who came up with the idea of the secretly getting Palestinian and Israeli representatives together to talk – and become friends. Both sides hated the other but neither had actually met anyone from the opposite side. Once they were forced to go behind closed doors to talk they actually realized how much they had in common and forged a bond that took them all the way to the peace table. So powerful and life affirming. Lillian Hellman’s The Little Foxes was first successfully produced in 1939, the revival that we saw on our trip was the latest of many. The play is set in 1900 in a small town in Alabama and deals with issues that are still very relevant today – racism, sexism, and economic inequality. This production stars Cynthia Nixon and Laura Linney in the 2 leading female roles (which they alternate playing on different nights). Richard Thomas plays one of the leading male roles. We saw Laura Linney as Regina and Cynthia Nixon as Bertie and they as well as the rest of the cast were very good. The play itself is considered to be one of the classics of the 20th century and many of the great actors/actresses of this century and the last have played in it. Tallulah Bankhead starred in the Broadway original and Bette Davis starred in the movie. Other revivals have starred Ann Bancroft, George C. Scott, Elizabeth Taylor, Maureen Stapleton, and Stockard Channing. I have to say that considering that the play is almost 80 years old it has held up extremely well. You can learn more about the cast and production by watching the video below. I’ll talk about more plays and some museum exhibits in my next post. Be sure to subscribe above so you don’t miss hearing about the rest of our trip!! 6 replies to "NYC Vacation Report"
Glad you enjoyed the post. We did have a fantastic time and there’s still so much more to tell everyone about. 3 and 1/2 weeks in New York! I am so jealous! I went there once and stayed for one week and had a fantastic time, but felt it’s not long enough. I am interested seeing Oslo after reading your post. Thanks for sharing! Claire – thank you for your comment! I’ll be posting more on the rest of the list as well as the museums we went to. the list is too long for one post! Sign up to get notified when I post next! I checked your post out and it’s great – love the pictures. Agree that the Q line is wonderful – we took it a number of times this trip (and last). Not only is it clean but it’s not as crowded as the other lines. 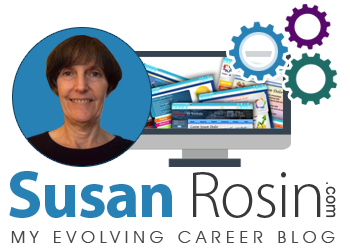 Will go over and leave you a comment tomorrow on your blog! !